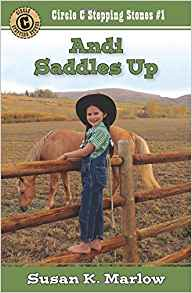 Andi Saddles Up is the beginning of Susan K Marlow's whole new series, Circle C Stepping Stones. It follows after the Circle C Beginnings series. In this book, Andrea "Andi" Carter, celebrates her ninth birthday. She's finally old enough to ride her beloved palomino, Taffy. She wants to learn to trick ride like her old friend Riley used to do, but her dear old brother, Chad, isn't having it. She meets a new friend, Sadie, whose pa is arguing with Chad over land. Can these two still be friends? My daughter was so excited when I got this in the mail. I am not surprised when she wanted to read it for our nightly story time right away. We enjoyed Andi and her new friend, Sadie. There is a good lesson to learn and a good reminder to me that adults can learn a lot from children. A great start to a new series. My daughter and I can not wait to continue our nightly ritual with book two. I received this book from the author, but was not required to write a review. This review is 100% of my own honest opinion. Andi Under the Big Top is the second installment from Susan K Marlow's new series, Circle C Stepping Stones. It is summertime now and the circus is coming to town. Andi is excited to see the show. 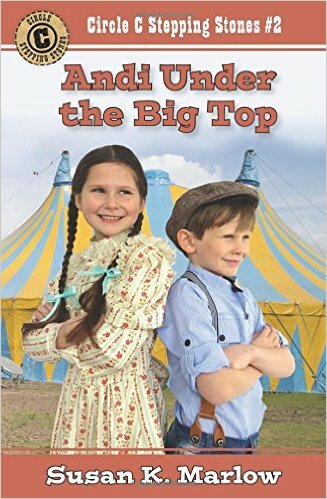 She meets a new friend, Henry Jackson, a little boy that works and travels with the circus. Andi finds out he's a runaway and wants to help him get back home. Helping him could cost her more than realizes! My daughter and I happily added this book to our nightly reading time. It was fun to imagine what a traveling circus was like in the 1870s. And poor little Henry. We were rooting for him to get back home. We enjoyed this story and it's lesson, but enjoyed book #1 more. Looking forward to when book #3 releases.